Three men have been jailed for causing a public nuisance during protests at a Lancashire fracking site. 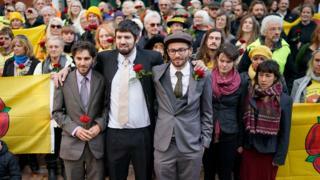 The men are believed to be the first anti-fracking protesters in the UK to be jailed. Simon Blevins, 26, and Richard Roberts, 36, were jailed for 16 months and Rich Loizou, 31, was jailed for 15 months. The three men climbed on lorries outside Cuadrilla's site at Preston New Road in July 2017, in a protest which lasted just short of 100 hours. A fourth man, Julian Brock, 47, was given a 12-month jail sentence suspended for 18 months after pleading guilty at an earlier hearing. Blevins, from Sheffield, Loizou, from Devon, and Roberts, of London, were convicted of public nuisance by a jury at an earlier trial. The court heard the men all arrived independently of each other at the site. Loizou came down after 45 hours because he said he was tired, wet and needed the toilet, while Blevins jumped off after 73 hours, the court heard. The judge said Blevins told jurors "without a trace of irony" that he came down because he needed to be at work the following Monday. Roberts came down after 84 hours and told the court it was a Friday and he did not want to spend another week on top of a lorry. Image caption The energy firm has said fracking will begin in "the next few weeks"
In sentencing at Preston Crown Court, Judge Robert Altham said the protests "caused costs and disruption" to Cuadrilla "but their other victims were the many members of public who were nothing to do with Cuadrilla". He expressed no view on fracking which was "not the business of the court". The judge also said it was "not a frivolous topic" and that environmental matters were to be taken seriously. The sentences would have been "considerably longer" if they have not been committed against a background of protest, he continued. But he said he could not suspend the jail terms despite accepting the impact of incarceration and the good they did in the community. "I do find they provide a risk of re-offending," he said. The Preston New Road site, near Little Plumpton, has been the subject of continuing protests from local people and campaigners. A trespassing ban was recently extended for two years. Cuadrilla said fracking would begin on the site in the next few weeks. Chief executive Francis Egan said the company had "respected the right to peaceful and lawful protest". But he added it would "condemn unlawful, irresponsible and reckless behaviour". "It is, in our view, a shame that it has come to this but the crown court has today taken the correct decision in imposing custodial sentences," he said. Greenpeace UK executive director John Sauven said the protestors "deserve our gratitude, not a prison term". "It's a strange society that massively rewards those responsible for causing more climate change while putting those trying to stop it in jail," he said.